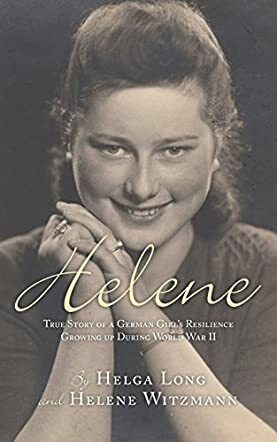 Helene: True Story of a German Girl's Resilience Growing Up During World War II by Helga Long and Helene Witzmann is a non-fiction memoir detailing the life of a young girl in Germany during the early decades of the twentieth century through World War II. The book depicts a collection of stories and recollections in the first person by Helene, born in Germany in the 1920s. In this book, Helene, in conversations with her daughter, talks about her early life, childhood memories, siblings and parents, family life, the rise of the Nazis, joining the Nazi Youth movement, marriage, their years during World War II, her husband’s role in the military, their eventual application and immigration to the United States, and more. In Helene, I saw a portrait of life for a German citizen who lived during and before the World War II era. I liked the overall writing style of the book, which provides a brief historical synopsis of that period followed by actual recollections by Helene. That being said, after reading the book, I was left with the impression that this was a fairly good life. Helene and her family seem to have been, relatively speaking, more fortunate than others during World War II. The writing style is quite engaging and flows more or less in a chronological manner. There is a small synopsis at the beginning of each chapter that summarizes the world events of that particular period, and which provides a context for Helene’s memories from that same period, which is helpful. This is a book for readers who want to learn about World War II from the perspective of a German citizen of those times.